Please review the College-wide Advising Policy and the Academic Advising Agreement below to understand the role and expectations of both the student and advisor. While the Center for Student Success is the primary advisor for students who are in transition (dismissed from major and looking to explore a new program, or, where possible, work toward re-acceptance into their previous program), CSS can also serve as additional layer of support in the academic advising process to any TCNJ student. Working as a supplement to the departmental academic advisor, CSS can provide resources and support for students seeking clarification and guidance in choosing the courses necessary to gain the optimal experience at TCNJ. The Center for Student Success works closely with academic departments, the Career Center, as well as other campus-wide resources to help students explore programs that will align with their skills, interests, and goals. CSS professional staff members serve as college-wide generalists and in no way take the place of faculty advisement. You’re encouraged, and often required, to meet you’re your departmental academic advisor at least once per semester. We encourage students to understand their responsibly as advisees, which begin with an active participation in the advising relationship. Preparation for advising appointments (understanding requirements, forming meaningful questions, etc.) will make for an engaging and more effective advising meeting. 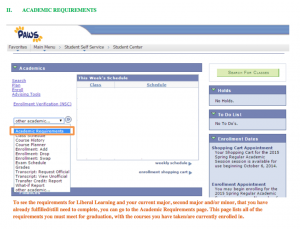 Download for a user friendly guide for navigating PAWS’s registration and advising features (prepared by Jenna Krizan, former CSS Peer Advising Coach).